Nearly half the people in the small, crowded room had Divest McGill stickers on their clothes. The visible exception was in the row of well-dressed university administrators. Such was the scene at the first of three public consultations on sustainability held by McGill University last Friday. The consultations come as a direct result of a sit-in carried out by Divest McGill in the James Administration building last spring. “We’re not going to stop bringing this forward,” she said. The consultations took the form of town-hall style open forums, with a moderator who framed the discussion. The subjects at hand were divided into three sections—sustainability on campus, sustainability in research, and sustainability in the university’s investment practices. The majority of the conversations that occurred were focused on the school’s investment practices. Participants—both students and faculty—made calls for the university to sell its investments in fossil fuels and associated infrastructure. Josh Spencer, a 2015 graduate from McGill’s International Management program, said at the forum that he plans to return his diploma to the university if it does not commit to divestment by the end of the school year. Over 20 McGill graduates returned their diplomas at the end of the 2015-2016 school year for the same reason. 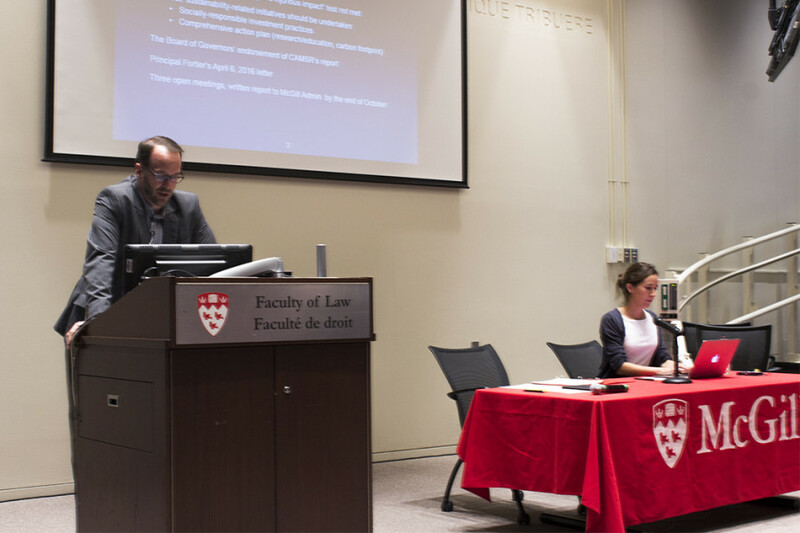 Many participants referenced last spring’s report by McGill’s Committee to Advise on Matters of Social Responsibility, which served as a justification for the university’s decision not to divest from fossil fuels. Participants denigrated the report, arguing it was based on severely flawed logic. Indigenous issues were also repeatedly mentioned during the consultations. One speaker, who identified himself as a member of Gitxsan First Nation in British Colombia, argued that the fossil fuel industries McGill invests in are actively destroying his community. Nearly in tears, he said McGill has a moral responsibility to divest if the university truly cares about Indigenous people. He received a standing ovation following his speech, but McGill Principal Suzanne Fortier did not participate in the applause. Fortier spoke once at the forum, following an intervention by a Divest McGill member. The student had pointed out that Fortier, during a conversation with Divest McGill last spring, had argued that oil companies breaking the law is understandable because most people break the law at some point in their lives. Fortier responded to the student’s reminder by saying no one is perfect. It is unknown what McGill plans to do with the results of the consultations. Jed Lenetsky, who’s in environmental studies at the university, said Divest McGill would be in negotiations with the administration following the end of the forums. The two remaining consultations will take place on Sept. 28 and Sept. 30.